Environmental Monitoring Services is the application of science and engineering principles to improve the natural environment (air, water, and/or land resources), to provide healthy water, air, and land for human habitation (house or home) and for other organisms, and to remediate polluted sites. It involves waste water management and air pollution control, recycling, waste, radiation protection, industrial hygiene, environmental sustainability, and public health issues as well as a knowledge of environmental engineering law. It also includes studies on the environmental impact of proposed construction projects. Scientists have developed air pollution dispersion models to evaluate the concentration of a pollutant at a receptor or the impact on overall air quality from vehicle exhausts and industrial flue gas stack emissions. 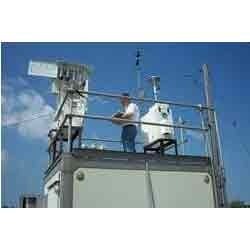 We are highly influential in rendering Air Quality Monitoring Services. which are known for their timely execution and accurate results. In order to render this service proper equipments are used for evaluating the concentration of pollutants in the air released by factories. Our efficient personnel are capable to work under pressure by giving best output results. Services offered by us proffer long-lasting ecological and financial benefits, together with long-term emissions drop potential.